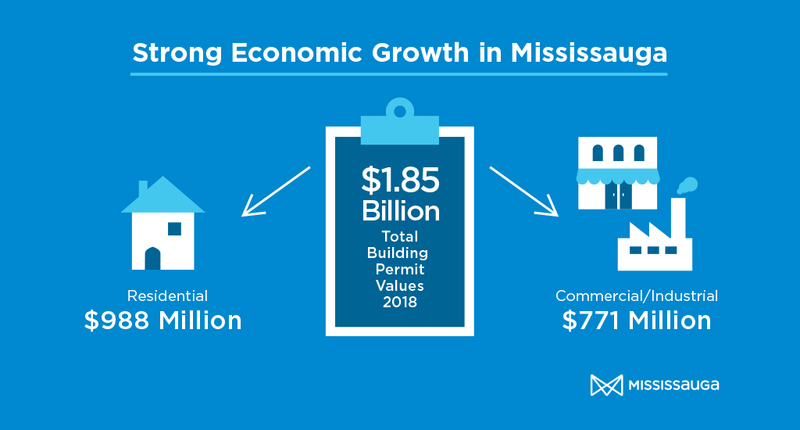 The City of Mississauga issued nearly $2 billion in building permits in 2018, a strong indicator of Mississauga’s thriving economy and prolonged growth. In a 2018 report, 3,884 building permits were issued with a total value of $1.85 billion, which covers all types of building permits including new buildings, additions, garages, decks and sheds. The City fostered more than $771 million in industrial and commercial building permits. Residential permits made up $988 million of the total value. These permits created 3,312 new residential units and represent 53 per cent of the total permits issued. Approximately 41 per cent of permits were issued for industrial and commercial permits. The remaining permits were issued for public institutions (2.2 per cent) and churches/schools (2.3 per cent) of total permits. Pre-zoned lands for business – avoiding lengthy rezoning processes. Issuing of conditional building permits. This allows site work to begin, while a builder addresses minor outstanding requirements. A development liaison position, which helps the development application process. For more information about building permits in Mississauga, please visit the Planning Information Hub.